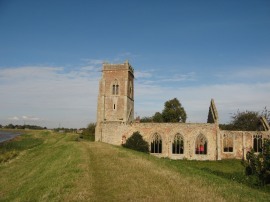 I did this, the third and final stage of my walk along the Fen Rivers Way on Sunday 14th October 2012. 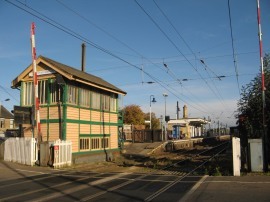 I drove over from Anna's to King's Lynn where a days parking at the station car park cost a reasonable £2 for the day. From there I took the 9:28 train down to Downham Market; a single ticket costing £3.70 which seemed quite good value for the journey compared to some of the rail fares I get charged in the South East. 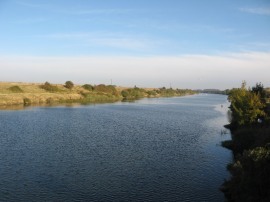 From Downham Market station, photo 1, it was just a short walk past the Heygates Mill and over the flood relief channel, photo 2, to rejoin the Fen Rivers Way on top of the flood bank running alongside the River Ouse, photo 3. It was a cold and chilly start to the day, the car thermometer was showing only 5c when I got to King's Lynn, and there was a strong breeze blowing from the North, however it was dry and bright with barely a cloud in the sky apart from a bank of clouds way out to East just visible on the horizon. 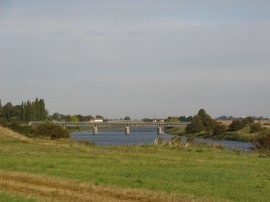 Not long after leaving Downham Market the River Ouse and the flood relief channel run quite closely to each other and it was really interesting to see how far below the river level the flood relief channel was at this point, photo 5. It was easy walking along the top of the broad grass covered flood bank running alongside the river, thankfully with none of the nettles that had plagued the previous stage. The tide was going out and for a while there were a steady stream of clumps of reed floating downstream on the water, almost at my walking pace. 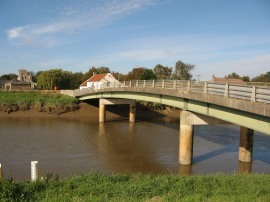 2.6 miles from Downham Market the Fen Rivers Way reaches Stow Bridge where the route crosses over West Head road bridge before continuing on down along the flood bank. 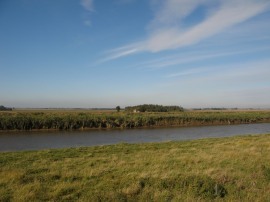 As I headed on down stream, photo 7, an ever growing stretch of mud bank was being exposed along the rivers edge as the tide headed steadily out and from the path there were far reaching views on either side across the flat open fen, photo 8. 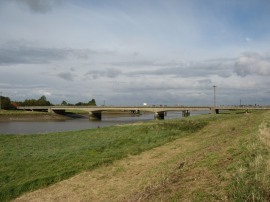 The route heads past the stone supports which used to support an old rail bridge across the river on the line that ran from Watlington to Wisbech. 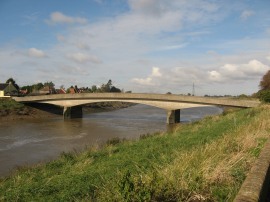 The line closed in 1969 and although this bridge has now been removed away to the right the bridge across the flood relief channel was still in place, photo 9. 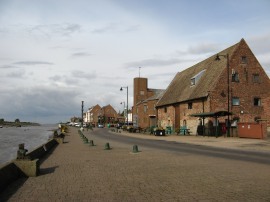 I was feeling in a really good mood and was signing away as I walked along which of course coincided with me being passed by a jogger, the only time I met a person all day until the outskirts of King's Lynn. 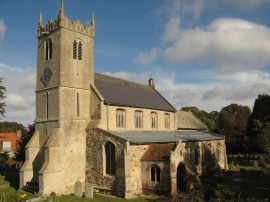 5.4 miles from Downham Market the route reaches the village of Wiggenhall St Mary Magdalen with its very impressive church and also the second road bridge, photo 10, across the river that I had passed on the walk. Once again the route continuing straight over the road and along down the same bank of the river with the flood relief channel still running just a few yards away on the right. 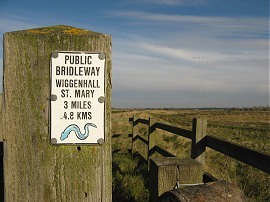 Besides the bridge was a wooden sign for the walk, the weathered wood looking almost identical in colour to the concrete of the bridge wall, photo 11. 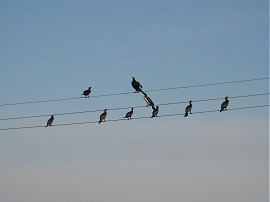 I saw plenty of different birds on this walk including Goldfinches and Partridges on the river bank, Herons and a very large flock of Cormorants flew over as well as quite a few ducks which I didn't recognise what they were. 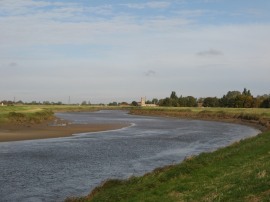 Below the bridge the route passes an isolated sewage works and follows the river Ouse as it curves round to the left, photo 12, towards the ruined church at Wiggenhall St Peter. I stopped for a short snack break outside the church, photo 13, before continuing on downstream and two miles on down the river from Wiggenhall St Mary Magdalen the Fen Rivers Way reaches the village of Wiggenhall St Germans with it's rather bland concrete road bridge, photo14, across the river. Here the route crosses Lynn Road by the St Germans church and the Crown and Anchor pub. On the other side of the road was information board for the Fen Rivers Way, the first one I had seen for quite some time, and this also made mention of the Ouse Valley way which runs for some 150 miles from the source of the river at Syresham, this walk has shared its route with that of the Fen Rivers Way since just before Ely. 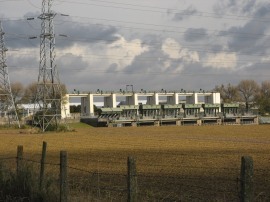 The route passes the entry channel on the left which leads up to the sluice on the Middle Level Main Drain as the River Ouse starts making its way in a big curve round the flat countryside, photo 16, towards the buildings of King's Lynn Power Station which had been visible in the distance from the start of the walk at Downham Market. 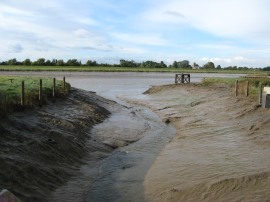 This part of the river bank was being grazed by cattle and a couple of times I had to drop down off the flood bank to bypass the cows which were massed on top of the flood wall and showing no inclination to get out of the way. 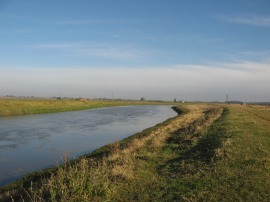 The river channel became much broader as I headed down this stretch of path, photo 17, and 9.5 miles after leaving Downham Market I finally drew level to the power station, photo 18. 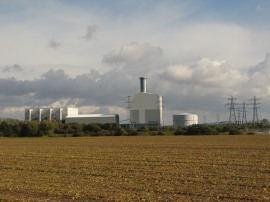 Although this power station is comparatively new, having been commissioned in 1997, it was mothballed in 2012. 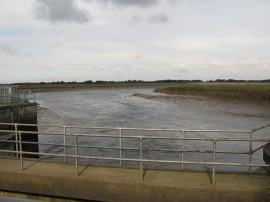 Close beside the power station is the Relief Channel Tail Sluice which marks the point where the flood relief channel joins back into the main river, photo 19. 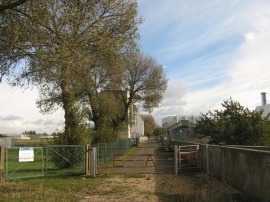 The route then heads round to the right to join a tarmac path which runs across the top of the sluice, photo 20, where an automated warning message is triggered at each end. 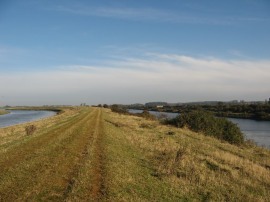 Once over the sluice the route heads to the left along a surfaced path running along the top of the flood bank which runs round the edge of a small area of marsh land back to the waterside. The path then heads down past the large new industrial building of the Palm Paper newsprint works. 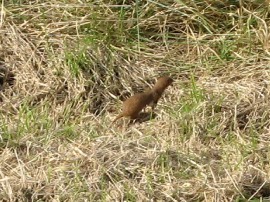 Here I spent ages trying to photograph a stoat running alongside the edge of the path although when it finally got close to me the batteries went dead on my camera so I ended with just a few blurry distant shots, photo 22. I did have an enjoyable time watching it though, it was the first one I had seen running about close to me for ages. 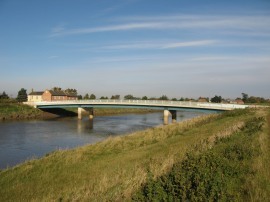 The path then heads on under the A47 road bridge, photo 23, and cross over the Clenchwarton Road by the Free Bridge as the path makes its way towards King's Lynn, photo 24. 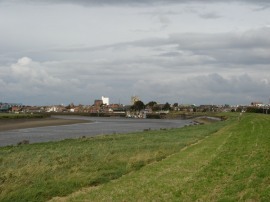 As the Fen Rivers Way nears the town the path heads to the right to cross over the River Nar by its outfall sluice, photo 25, before following a footpath that skirts round an area of marsh which leads back to the waterfront in King's Lynn. 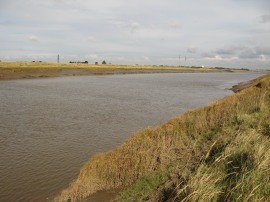 From there it was just a short walk down to Green Quay where the Fen Rivers Way ends. There was another of the noticeboards for the walk outside the buidling and also an information baord for the Nar Valley Walk. 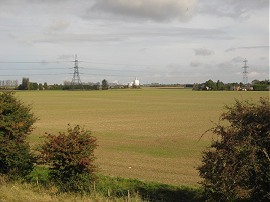 Reaching this point I had walked 12.0 miles from my start point at Downham Market. I then made my way through the streets of King's Lynn back to the station car park. This stage had been easy walking throughout and had been a far more enjoyable walk than the previous one where I had been hindered by the very overgrown paths covered in nettles. There were no such problems this time and I was disappointed to have reached the end of the path when I did. Anyway, another recreational trail completed through an area I hadn't walked in before. Special thanks go to Anna for letting me stay with her while I was doing this walk. 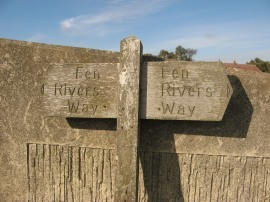 As usual I have uploaded the route of the walk which can be accessed here: Fen Rivers Way 3 route.